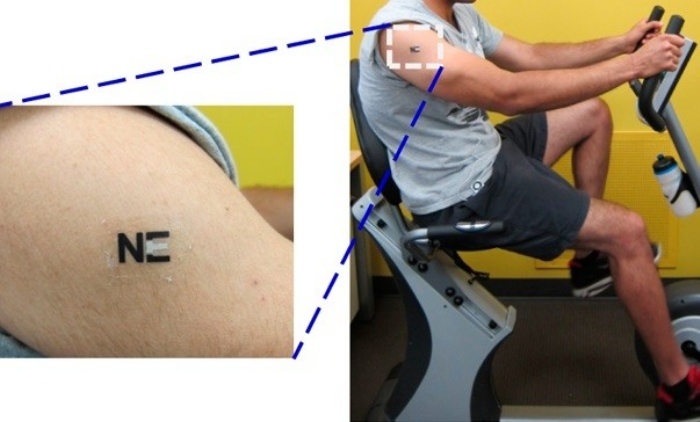 Biosensor Tattoo Lets Athletes Know When They've Reached Their Limits | OhGizmo! What Would Link Look Like If He Sailed Through Pop Culture? By Hazel Chua on 08/01/13 • Leave a comment! Some athletes push themselves so hard that they end up hitting “the wall”, which is when their energy level suddenly dips and they just collapse, exhausted and completely spent. So why does this happen? Well, when a person performs vigorous activity for extended periods, lactate builds up and causes fatigue. If you’re the type who’s keen on pushing yourself physically, then you might find a lot of use with this lactate-monitoring biosensor tattoo. It was created by Professor Joseph Wang and his team at the University of California. When affixed to the skin, it continuously notes the the amount of lactate excreted in the person’s sweat. It was tested out on ten people who were working out on exercise bikes, where it was sufficiently able to measure the increase in their lactate levels.